We also deeply thank departing board members Brandon Howald, of Paul Hastings and Steven Craig, Chief Executive Officer of Craig Realty Group, who have completed their prescribed board terms. Steven continues to actively serve as Chairman of our Advisory Council and Brandon continues to serve on our Technology Committee. Ethan Kay is founder and principal of Pacific Rim Capital Management, LLC. Prior to launching PacRim, Ethan successfully established businesses in a variety of industries from online social networking, global textiles and commercial real estate. In 2011, Ethan started an option-based strategy, which is now known as Pacific Rim Structured Alpha. He received his B.A. in International Studies from Southern Methodist University and returned to his alma mater for his MBA with a concentration in Finance. Ethan grew up in Orange County. He and his wife, Nina, have two small boys who have already toured KidWorks preschool. Dr. Susie López-Guerra, Ed. D, is Director of Community Relations for the Santa Ana Unified School District (SAUSD), where she has developed a comprehensive network of partnerships with stakeholders throughout the county. She collaborates with local businesses, community organizations, parent groups, other SAUSD departments and school sites to establish and leverage mutually beneficial relationships. A first-generation college graduate, Susie earned her bachelor’s degree from the University of California, Riverside; Master’s Degree from California State University, Fullerton and Doctorate Degree from the University of Southern California in Teacher Education in Multicultural Societies. She and her husband, Isidro, are the proud parents of Isabella, 14-years-old. You could say that Susie’s Santa Ana roots go back further even than KidWorks! Susie’s hobbies are reading and traveling with her family. 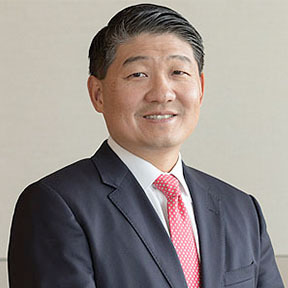 David Oh is an Executive Vice President at PIMCO and co-leads the firm’s U.S. institutional business development. He is also an account manager in the Newport Beach office, focused on managing relationships with corporations and healthcare organizations. David has 13 years of investment and financial services experience. He holds an MBA from Harvard Business School and undergraduate degrees in mathematical methods in the social sciences and economics from Northwestern University. PIMCO is an active KidWorks supporter, and David became involved with us through the corporation’s Purpose at PIMCO Foundation. David is married to Connie, an information technology professional at a law firm. They have two daughters, Victoria, 11 and Addison, eight. The entire family is active in a variety of sports. David also has an adventurous side. “As a university graduate, I participated in the annual running of the bulls in Pamplona,” he says. He survived the event without so much as a scratch! Please join us in welcoming our three new board members and thanking our two departing board members for their service and dedication to KidWorks.